This patch bank was used in the production of Chris Brown's popular song, 'Loyal'. 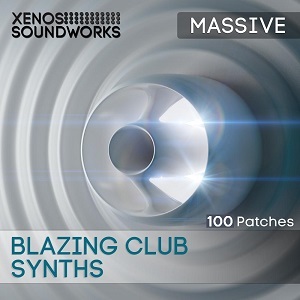 'Blazing Club Synths' contains 100+ presets for Massive. Each sound was specifically tailored for usability over a wide range of mainstream club style hits - hip hop, techno/house, breakbeat, moombahton, etc, making it a highly versatile 'workhorse' soundset, ideal for commercial songwriters working to finish that project before the deadline date. These patches cover a tantalizing variety of sounds - 29 firey leads, 29 energetic basses, 12 sweet pads, 10 synth plucks of various flavors, 9 sound effects, 5 chord stabs, 4 gated synths, and 2 synth keys. Intelligent Macro Control assignments on each patch are designed for maximum stylistic versatility and enhanced expression. Please note that these presets are in NMSV format only. MP3 Demo 1, by Bryan "Xenos" Lee, is in the Hard Electro/Breakbeat style. MP3 Demo 2, by Julian "Death Drums" Earle, is in the Electro Pop/Hip Hop style. - Improved Macro Control assignments. - Improvements on pre-existing patches.